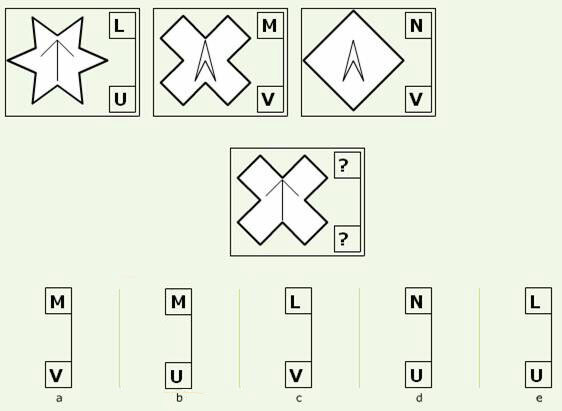 At first sight codes can appear to be some of the hardest NVR question types as they require many different levels of deduction to be made at the same time. However they can be completed when taken logically and step by step and when solved correctly, prove strangely satisfying! There are two main ways of setting out code questions, in a box grid as below or in a line with letters below the symbols but for both the logic is the same. The skill is working out what element of the symbols the code letters in the grid, or the letters next to the symbols, relate to and applying this to work out the missing code letters for the answer symbol. What logical steps can we make when we apply these observations to the code letters? As the 3 clue shapes are different (observation 3 above) does the top letter code represent the shape? L = star, M = hollow cross, N = diamond? Observation 5 suggests that the lower letter code represents the arrow part of the symbol.